Over the past few years we have learned that the best chance to save a life is to educate users before accidents occur. WBR has taught numerous courses on safe travel, snow pack evaluation, and self rescue. We host many slide shows and go to schools and public awareness groups to help educate school children and users in the art of avalanche awareness. Salt Lake City is surrounded by mountains that provide some of the most convenient access to the back country in the world. Riders can enjoy leaving the boundaries of the ski resorts and hike in the fresh air, solitude and untracked powder runs. New equipment available to enthusiasts allows easier access and in recent years the back country has seen more traffic the ever. Within the ski area boundaries on-going avalanche control work is conducted. The ski patrol carefully monitors weather, snow stability, and changing conditions for a safe opening. When an area is unstable it is closed until stability tests are conducted with ski checking, explosive tests, time, or when weather conditions merit the opening of the ski run. The mountains offer freedom for a rider to make decisions on what they feel is safe and what they would like to do. The rewards of a back country ski tour can be an amazing sense of freedom as you spend the day out on untracked slopes in a pristine and peaceful mountain setting. This can all turn deadly in seconds if a poor choice is made and a back country user triggers a slide and is buried under the snow. The best chance for survival after being buried under the snow comes from the victim’s partner. After just 15 minutes the chance of a buried victim being dug up alive is less then 30%. The best way for a partner to locate a buried friend is if they are wearing an Avalanche transceiver, and more importantly, they know how to use it. In 2005 Utah had a record number of avalanche fatalities in the back country. Seven people lost their lives after being caught and buried under the snow. Three out of seven of the victims were wearing transceivers, however, it took the partner of a victim over a half hour to find his friend buried under only a few feet of snow. In the second case, it took witnesses to a buried snowmobiler over an hour to find a buried victim with a locator. In the third case all of the people in the victim’s party had probes, shovels and locators; unfortunately no one had ever practiced with their equipment before. The other four fatalities occurred on victims that were not wearing any kind of locating device, which shows the need for avalanche rescue dogs. When we started teaching the Back Country Skills Seminars and free Locator Clinics five years ago, we noticed that a surprising number of people that owned locators and took the courses didn’t know how to use their equipment or were very slow with it. A transceiver is not terribly difficult to use, but a user needs to practice with it to gain speed and accuracy. This is especially important in the key clutch moments that you have to find a buried friend, when adrenaline is kicked into overdrive and time is critical. 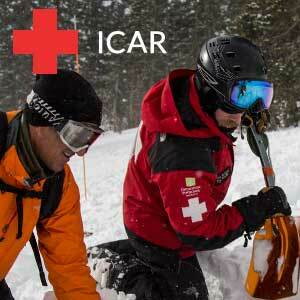 The Wasatch Backcountry Rescue group is committed to saving the life of an avalanche victim. 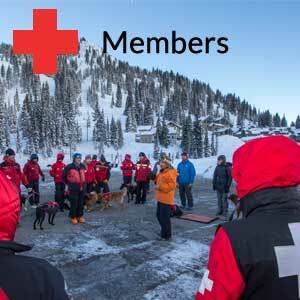 Our teams are trained in rapid response to accidents in the back country and our goal is always a live recovery. 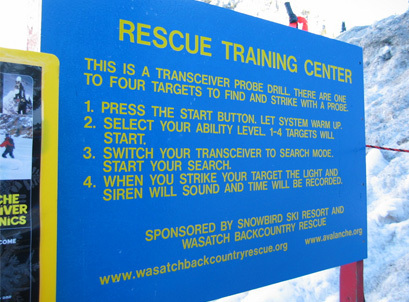 Wasatch Backcountry Rescue has installed Rescue Training Centers in at The Canyons, Little Cottonwood Canyon, Solitude, and Snowbasin. These are the first fully automated transceiver practice facilities in North America; they are open to the general public and free of charge. A person grabs a probe from the top of the search area and goes to the control panel with their locator. Three ability levels can be selected: Beginner, Intermediate, or Expert. If the user selects beginner one target in the search field will start pulsing like a simulated buried victim. Intermediate will start two targets, and expert will start an unknown number of targets between one and four. Once your ability has been selected the clock starts timing. The user will start their search, using step downs and probing the area where the target is buried. When the searcher makes a probe strike, lights flash, sirens sound and the time is recorded. When all targets are found the siren sounds three times to let the searcher know they have completed the exercise. This helps users practice with their equipment, which is something that has be difficult to do in the past. 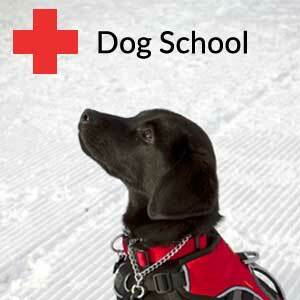 WBR sees this as a practical education tool and our hope is it saves lives. WBR instructors also use the RTC to hold training courses. A WBR instructor can remove the brain from the control box and wear it around their neck while teaching. This allows the instructor to turn on any of the buried targets while teaching, as well as have them simulate the pulse of nine different types of locators. Practice just got easier, our hope is it makes a difference. Back country users need to know how to use their equipment and take an active approach in learning about the mountains they are traveling in. 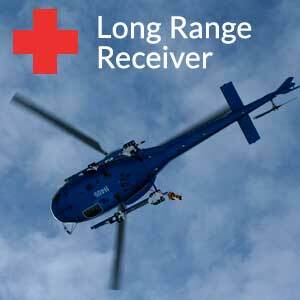 WBR is committed to saving lives and we will continue to search for new ways to do so. After all, we understand the satisfaction in skiing beautiful untracked powder snow.